Unfortunately, he’s not headed for a good night’s sleep. 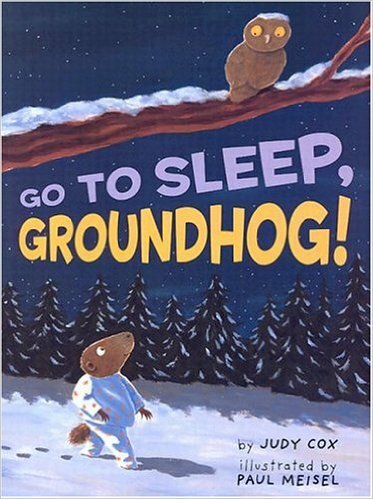 In Go to Sleep, Groundhog, the pointy-nosed groundhog puts on his jammies and sets his alarm clock, but after curling into his cozy bed, he just tosses and turns all night. He checks his clock – which says “half-past October” – then goes for a stroll under the full moon outside his burrow. And to his surprise, all the houses are decorated with pumpkins! It’s a funny story that lets children enjoy a new perspective on other holidays throughout the year. Eventually the groundhog returns to bed, but he tries another stroll at half-past November, and discovers – again – “things he’d never seen before! Tall yellow corn shocks and round orange pumpkins. Turkeys gobbling in the barnyard…” He returns to bed to try to sleeping again, but just ends up seeing even stranger sights in December. Paul Meisel really seemed to enjoy illustrating this book, filling the pages with simple colorful acrylic pictures for each of the festive holidays. And there’s a secret second story lurking this book’s illustrations, since the groundhog’s tree burrow is shared by a friendly mouse! He watches silently each time the groundhog wakes up early, and curls up next to him on the pillow when the groundhog returns to bed. When it’s finally February 2nd – Groundhog Day – the little mouse follows him up the burrow’s sunny stairs, where he shares in the book’s funniest moment. “What am I doing up?” the groundhog asks. “There are six more weeks of winter coming!